New Liturgical Movement: Painting Created by Artifical Intelligence Sells For $432K. Is This Art? 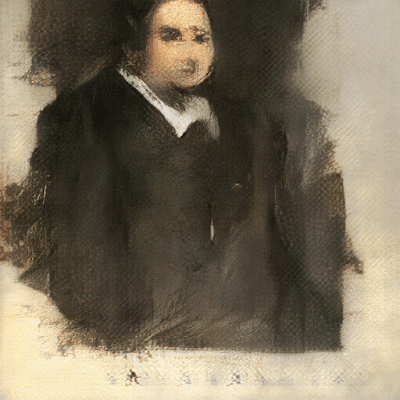 Painting Created by Artifical Intelligence Sells For $432K. Is This Art? As a follow up to an earlier piece about the validity of reproductions as art, here is an article about an image produced by three computer developers with no background in art, which sold for a staggering $432,500. AI - artificial intelligence - is the latest fad artist, it seems. Artificial intelligence is not intelligence as a Catholic would understand the term. I saw recently saw George Gilder (author of Life After Google) talking to Mark Levin about this, and he gave a good explanation as to why. For all the power of the machine to collect and process data, the way in which it does so is limited by the algorithm, which is, in turn, a reflection of the programmer who created it. He is saying in effect, it seemed to me, that because intelligence is a faculty of a spiritual soul, it can’t be in a machine. The idea behind the AI machine exists in the mind of the person who made it, just as the idea behind a work of art exists in the artist who painted it. Without a spiritual soul, there can be no inspiration, and hence no authentic creativity. The AI machine, therefore, is an artifact and a sophisticated tool in this painting process, and the programmer is the artist. So is this art? I say yes, perhaps. The artist, in the case of AI-generated paintings, is not the machine, but the programmer or programmers who created it. They can create a good algorithm or a bad one; the test is in the quality of the work that comes out at the end of the process. My argument is not that the human element isn’t necessary for the creation of art. Rather, it is that the human element is not absent from AI (or from printed reproductions, from photography etc). All of these are just different ways of controlling the production of an image. And just like painting with a brush, the process by which the image is created can potentially produce good or bad art. Art is the product of artifice, and is by nature artificial. Artificial intelligence, therefore, is a misnomer. It is a creation of the programmer who created the algorithm but it is not in itself creative. AI is artificial like art itself, and the print is an artifact, but AI is not intelligence. Is this good art? I would say no. Art is as good as it looks, and if it looks good, it is good. And (this is just a personal opinion) I don’t think this is good. But that could change, perhaps. The prodution of good art by these means would probably require programmers who understand art, and how to instill in the machine a systematic process of pattern recognition and image generation that is in harmony with good art, and thus controlling the image. If, at the end of the process, someone judges the quality before presenting it for sale, perhaps modifying the process in response to improve the image, you have a more authentic artistic process. I’m not sure it’s worth the effort, but I imagine the programmers in this instance could come up with 432,500 good reasons to do it.